On 5 June, coinciding with World Anti-Counterfeiting Day, the Intellectual Property Investigation Bureau of Hong Kong Customs was highly commended by the Global Anti-Counterfeiting Group and presented with a Global Anti-Counterfeiting Award to recognise its outstanding achievements in combating counterfeiting and piracy. 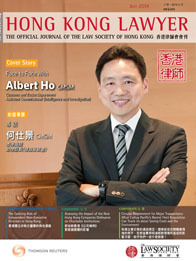 Following on the heels of this success, Hong Kong Lawyer speaks with Albert Ho, CMSM, the Assistant Commissioner of Hong Kong Customs overseeing the Intellectual Property Investigation Bureau to learn more about the Bureau’s work, its achievements and the challenges it faces due to rapid technological advances and the increasing popularity of e-commerce. Since its colonial days as a free port, Hong Kong has maintained its strategic position as an entrepôt in Asia and a gateway to China. With over 250 million tonnes of goods passing through the City annually and its proximity to the Pearl River Delta, Hong Kong has realised its importance to intellectual property rights (“IPR”) protection and has implemented stringent and innovative anti-counterfeiting and piracy enforcement measures, for which it was recently commended. At the helm of Hong Kong’s anti-counterfeiting and piracy efforts is Assistant Commissioner Albert Ho, CMSM, of Hong Kong Customs’ Intellectual Property Investigation Bureau (“IPIB”). Ho currently oversees all Customs intelligence and investigation work, which not only covers IP crimes, but also narcotics, smuggling, illicit cigarette activities, organised crime and money laundering. Ho is a Certified Fraud Examiner (“CFE”) and is the director of the local chapter of the Association of Certified Fraud Examiners (“ACFE”) in Hong Kong. He is also a member of the Chartered Institute of Linguists based in London. He holds a Bachelors and Masters degree in Laws and a Masters degree in Applied Criminology from the University of Cambridge. Ho was admitted to the Middle Temple (Inns of Court School of Law) and called to the bar (barrister) in England and Wales and in Hong Kong. In 2012, he was awarded the Hong Kong Customs and Excise Medal for Meritorious Service (“CMSM”) by the Hong Kong SAR Government. Hong Kong’s IPR enforcement regime is unique in that Hong Kong Customs is the only enforcement agency responsible for investigating and prosecuting IP offences within the territory and at the boundary control points. “Given its exclusive jurisdiction, IPIB can operate as a one-stop shop. If an IPR owner has a complaint, they can just deal with one Customs officer from the time the complaint is lodged until the time the counterfeit goods are destroyed. This approach is convenient for the IPR holders and the general public. It also enables the IPIB to carry out its work efficiently, which is particularly important when complicated IP right issues are involved,” says Ho. Keeping the law aligned with advances in technology is difficult. “Innovation is wonderful,” Ho beams, “but it often causes many practical problems.” The invention of peer-to-peer (“P2P”) networks, he says, offered users many new benefits, allowing users to directly transfer or share files that contain a large amount of data in a very short amount of time. Even though P2P technology is perfectly legal – technology is neutral – Ho shared that they have caused a lot of damage. “About ten years ago, when a P2P technology known as BitTorrent gained traction worldwide, many users began watching and sharing movies and other copyrighted content free of charge. Since Hong Kong has a vibrant movie industry, this illegal file sharing scheme caused a lot of damage to local companies in this sector,” Ho explains. At that time, the defendant was believed to be the first in the world to be convicted of an IP crime that involved the use of file sharing technology. The case also raised many novel legal issues, such as whether making available a digital copy on the Internet constitutes distribution of copyrighted works under the copyright law. Luckily, the court answered it in the affirmative, sending a strong message to infringers using these platforms. However, Ho frankly admitted that though it was difficult to anticipate the court verdict at that time, Customs still instituted prosecution decisively with a view to curbing the prevalent P2P infringing acts. As the BitTorrent case illustrates, law enforcement must be creative to keep pace with the rapid changes in technology. Since the IP industry is very innovative and IP infringers are very innovative, Ho explains that he and his colleagues try to talk about enforcement in terms of innovation. Last year the IPIB established the Electronic Crime Investigation Centre (“ECIC”) to conduct research on how criminals are using technologies to commit cybercrimes with the aim of developing new cyber monitoring systems to assist enforcement officers and designing better training programmes for investigators. Ho indicated that IPIB has also deployed a strategy that they like to refer to as technology versus technology. One example Ho provided of this strategy was the implementation of the newly-developed Lineament Monitoring System I Plus, which uses web crawler technology to automatically detect and track down illicit file sharing through cyber-lockers. The system automatically browses discussion forums around the clock to search for suspicious posts and file sharing activity. Information on suspicious activity is then directly transmitted to Customs officers for further investigation. Ho notes that IPIB also employs similar technology to search e-auction sites selling counterfeits and to track down IP infringement by file sharing through BitTorrents. It’s no secret that the business of counterfeited and pirated goods is one of the largest underground industries in the world and it’s rapidly growing. Given the lucrative profits involved and the ease with which products can be moved in the online/digital space, this underground economy is receiving billions in investment from transnational criminal enterprises. To strengthen enforcement actions against copyright pirates and counterfeiters, the Organised and Serious Crimes Ordinance (“OSCO”) was amended to capture syndicated piracy and counterfeiting offences. Under OSCO, Customs has more expansive powers to investigate syndicated IPR infringement. Customs can also seek heavier penalties from the court and confiscate crime proceeds derived from piracy and counterfeiting. Customs also co-operates with the IPR industry and overseas law enforcement agencies and continuously monitors the market to target the organised and transnational nature of IP crime in cyberspace. To illustrate this point, as well as the sharp teeth that OSCO has given Customs, Ho noted his department’s recent work on the Megaupload case, which involved a large-scale transnational cyber-locker syndicate and OSCO-related offences. During a global snap operation led by the US Department of Justice (“US DOJ”) and the Federal Bureau of Investigation (“FBI”), Customs was able to seize over HK$300 million in liquid assets belonging to a hi-tech criminal syndicate, which aided the US DOJ and FBI in shutting down Megaupload’s illegal operations. Ho explains that it is essential for the IPIB to collaborate with IPR owners, but some IPR owners are neither located in Hong Kong nor have a representative here. “We realise that sometimes Hong Kong isn’t an IPR owner’s main market or that their presence in the market is small and for those reasons, an IPR owner may not want to bother coming all the way to Hong Kong or appointing a representative to enforce their IPR. To foster and enhance collaboration with these IPR owners, the IPIB set up the Electronic Recordation and Triage Centre (the “ERTC”) to save them money and help them avoid the hassle of travelling,” Ho says. Ho explained that it was also set up because it is quite problematic when an IPR owner does not want to come. When the IPIB takes criminal action, an individual’s civil liberties are at stake. “We not only seize goods, we also arrest suspected offenders. When an arrest is made, the offender may be detained for up to 48 hours for the investigation after which they may be prosecuted and end up in jail, which raises very serious human rights issues. Given what’s at stake, we are doing all we can to encourage and facilitate IPR owner participation so as to ensure the fairest possible and most efficient treatment to suspects during the criminal justice process,” Ho contends. So how does the Centre work? If an IPR owner is located overseas, after the IPIB identifies what it believes to be counterfeit goods, it contacts the IPR owner. The Centre has installed a high-definition internet television link so if an IPR owner cannot come right away, they can just log on to their computer, wherever they are located, and examine the goods through a video link during the initial investigation phase. Once they send their genuine goods, the confiscated goods and the genuine goods are compared through the video link so the owner can determine whether the goods are fakes. If the case is urgent, the IP owner can just send over a digital file to us and authorise IPIB to print it out by a 3-dimensional printer and carry out the comparison procedures abroad. “This system gives us the confidence to go out, seize the goods and then arrest the offenders,” Ho says. Since IPIB is reliant on the private sector’s help, it set up the Intellectual Property Right Protection Alliance (the “Alliance”) in 2004 with the IPR industry to enhance their partnership. Ho explains that the Alliance enables IPIB to better monitor the market and take prompt action against infringers, which leads to better IPR protection in Hong Kong. He also noted that the Alliance provides a forum where both parties can communicate and share intelligence. Additionally, the IPIB has launched programmes with different sectors within the IPR industry, such as the E-auctioning with Integrity Scheme with internet service providers, and the Jewellery Integrity Campaign with the jewellery industry. It has also implemented the Fast Action Scheme with trade fair organisers to expedite the handling process for exhibition-related claims. As exhibitions generally only last for one to two days, this Scheme allows the IPIB to more quickly respond on behalf of those who register their protected products before the exhibition. This process eliminates the need to clear the status of IPR owners, which can sometimes take up to two weeks. To curb the problem from the demand side, Customs has attached great importance to raising public awareness of IPR protection. Ongoing publicity and education programmes are organised to shed light on the economic harm these activities cause as well as the health and safety issues that arise when the supply chain is invaded with fake goods. Significant emphasis is also placed on educating young people to respect IPR and to distance themselves from any form of IPR infringement. The Youth Ambassador Against Internet Piracy Scheme – comprised of local youth organisations and their members – was developed to engage youth in the fight against internet piracy, as well as allow them to cultivate the sense of respect for IPR, explains Ho. On 5 June, the international community gathered at the GACG Awards Ceremony, where the GACG highly commended the IPIB for its long-standing commitment to combating piracy and counterfeiting and presented the IPIB with a GAC Award in the category of National Public Body. “I am humbled by this recognition. I must hasten to say that this Award is not just Hong Kong Customs alone but belongs to the thousands of passionate IP right owners and international law enforcement colleagues who work hard to fight IP crimes together with us on a daily basis. The challenges ahead will not be easy and IPIB will continue the innovative efforts to tackle IP crimes which has allowed Hong Kong Customs to accomplish the achievements,” Ho said. GACG presents GAC Awards every year on World Anti-Counterfeiting Day (a day established in 1998 to raise public awareness of the international costs of counterfeiting and piracy) to individuals and organisations that have made outstanding achievements and have ‘gone the extra mile’ in the battle against the trafficking of counterfeit and pirated goods. Even though the IPIB has captured the international community’s attention and praise for its strategic investigation and enforcement measures and its wide-ranging collaborative efforts, which have enabled it to make significant strides in IPR enforcement, Ho humbly acknowledges the challenges IPIB must overcome – namely, tackling the borderless online and transnational IP crimes; and identifying high-quality fakes and ensuring new products in local markets are genuine. It’s Ho’s hope that the IPIB will be able to work more closely with the Alliance and the IPR industry to tackle these problems through cooperation and further officer training programmes.